Today’s walk will boost your step count and eat up many of the calories you consumed this morning. There is great public transport here in Hong Kong, so we’ll set off from Sha Tin MTR station, out in the New Territories. Our goal is an intriguing hilltop temple built in the 1950s, with a nine-storey pagoda and an air of being far older than its true age. Head out of the station via exit B, down a ramp and past a row of traditional houses on your left at Pai Tau village. Now head towards the main road ahead and turn left on Pai Tau Street, then right onto Sheung Wo Che Street. Walk to the end of the street, which was fenced off with wire mesh when I arrived and I could see none of the English signs that I had been promised. At this point, just look harder than I did, and you’ll spot a gap in the fence on the left and a few yards further on you’ll find the comforting signposts. Do NOT do what I did, which is turn right and clamber up a chain of uncared for steps, through rickety iron gates, with no hand rail to help control my vertigo, and no sign of a temple. Fortunately, I met a local woman descending the same stairway, who clearly thought I was mad and directed me, with very clear hand signals, to the correct path – all the way back down and start again! With great relief, and a few slugs on my water bottle, I set off on the correct 400 steps, and more. I now had lots of friendly company to ensure I stayed on the correct path. 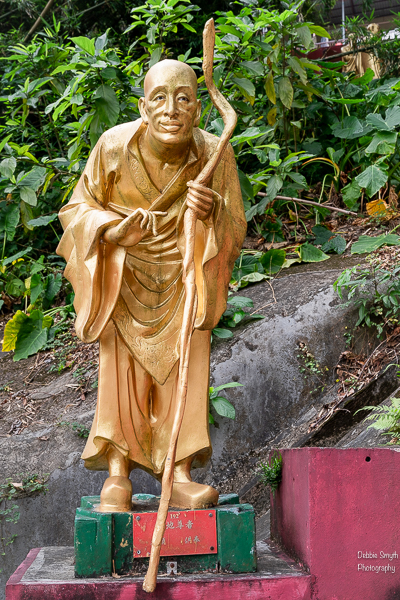 The 10,000 Buddha Monastery has dozens of life-size golden Buddhas lining the path to welcome and inspire. 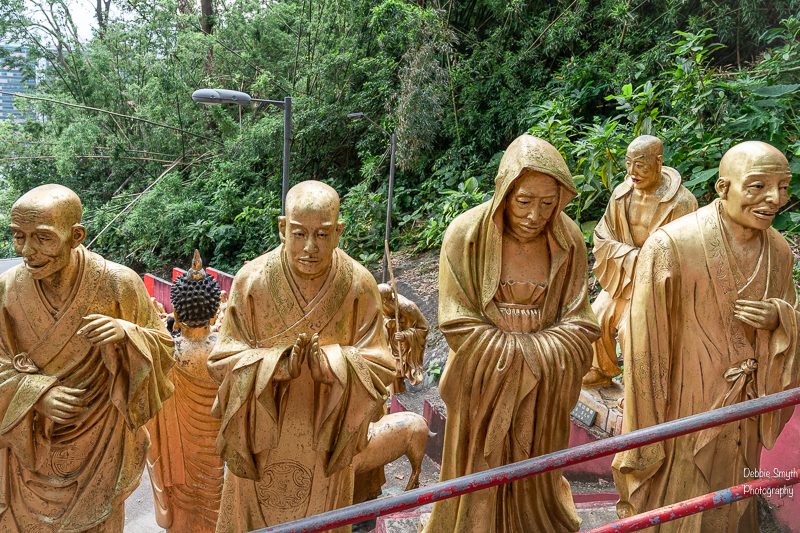 It is a steep climb, but the Buddhas welcome a chat and appreciate the photo opportunities offered by the clambering tourists. 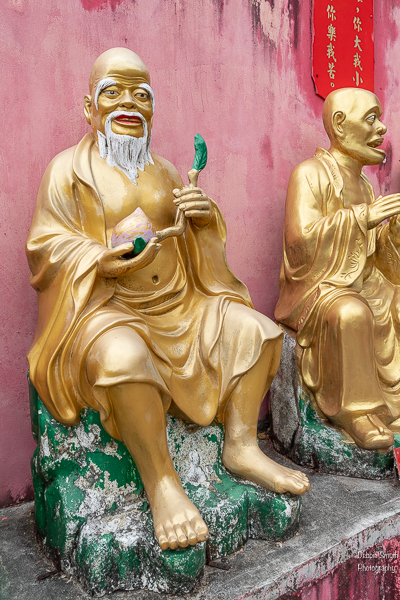 As I climbed, I marvelled at the varied appearance of all these characters – thin and fat; tall and short; old and young; jolly and grumpy – and very few resembled the traditional depiction of Buddha. 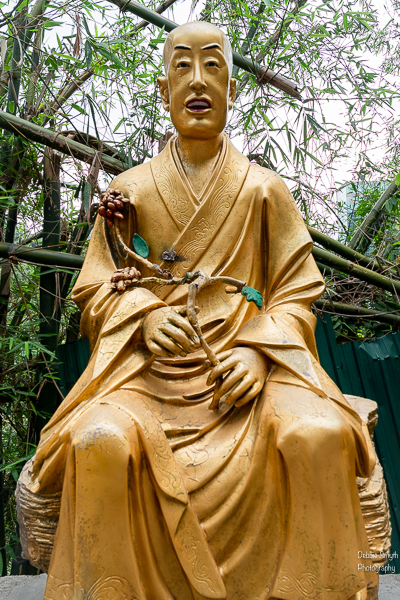 Us visitors assume they are Buddhas because of the name of the temple, but they are actually arhats, the Buddhist equivalent of saints who have achieved enlightenment. They were produced by local artists and modelled on ones at Kunming temple, the hometown of the founder of 10,000 Buddha Temple, Yuet Kai. These enlightened fellows are a recent addition, starting to appear only in 2001 and creating a rift between the temple and local authorities as permissions had not been obtained. I have to admit, I was very glad to learn that the arhats were newcomers. I had visited this temple back in 1992 and had no memory whatsoever of this golden climb. I know my memory is far from perfect these days, but still, how could I forget this? 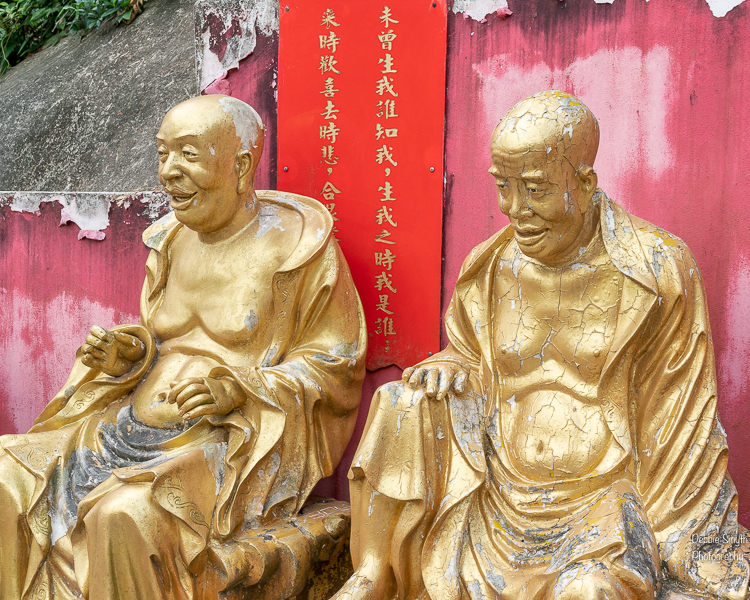 If the golden statues aren’t fully compensating for your fatigue, there are a few sheltered seats along the way, or maybe you could borrow a horse or cow to carry you up the final steps. 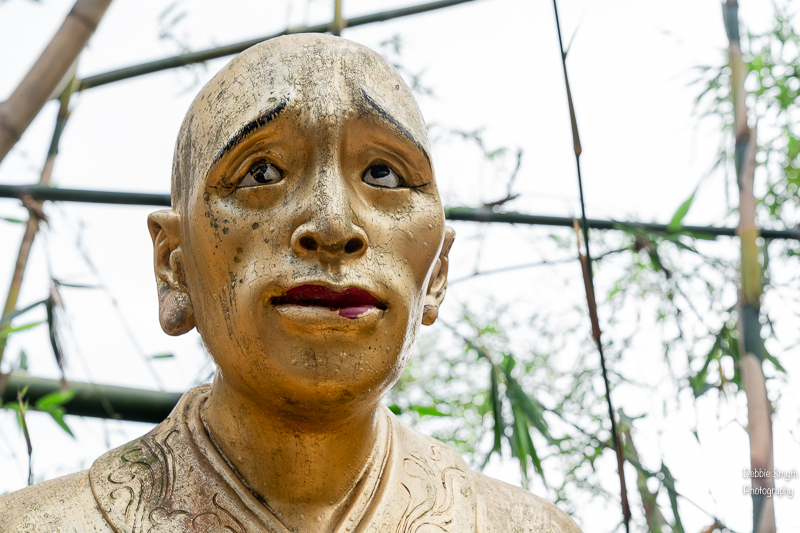 It is certainly not the easiest of walks on a hot day, and even some of the standing arhats feel the strain. But don’t give up, we are almost there. And it is worth the climb. At the top there are a number of halls and pavilions, a pagoda and some great statues. Inside the main temple, you’ll discover the real reason for the place’s name. There are around 12,800 miniature Buddhas lining the walls; an incredible sight. No photos allowed, so I’m afraid you really will have to walk the steps yourself. 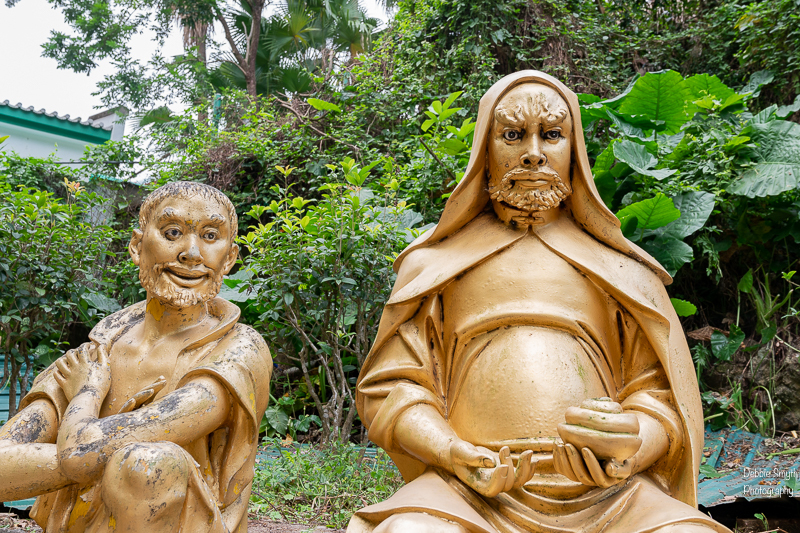 There are also a few more steps up to another area, where there is koi carp pond, more statues, a resting Buddha and some good views down to Sha Tin. Parts of this upper area are currently closed due to building and renovation work, with a sad history associated with some of this. Not long after my previous visit, a major mudslide crashed onto the temple, killing the caretaker and damaging some of the buildings. The site was closed for three years to carry out work to prevent future similar disasters, but if you look up above at the bare soil and dangling boulders, you probably won’t believe that is the case. My advice? – do not visit after or during heavy rain. But let’s finish with another appreciation of this temple and its setting, and prepare for the walk back down. A fascinating climb, Debbie. Those arhats are so amazing. What a smashing bunch of chaps, Debs! A fabulous welcome and definitely something to take your mind off the steps. If I had any energy left I’d be hopping and skipping up there, but packing boxes has just about done for me. 🙂 🙂 A social day tomorrow, though. Thanks for thinking of me. No Monday walk next week but possibly the week after, from the Algarve. Amazing the amount of artwork. Thanks for doing this climb for us! Worth every step. Is that a Kwan Yen in the last photo? Very interesting walk! Lovely clicks! That’s a lot of Buddhas (and arhats), Debbie! Quite the view at the top, too. Now I’m ready for breakfast, so enjoy the rest of your Wednesday.